The main menu has continue game, save game (later), new game, load game, settings and quit game. The main menu is accessed during gameplay by the ESC key. The setting has screen resolution, graphics quality, antialiasing, music volume, sound effects, speech volume and subtitles selections. To save, click on empty saving slot, enter a name and click on 'save'. Saved game can be overwritten. The inventory bar is at bottom of the screen. Some items that are not needed are removed at end of a chapter. Items can be combined by clicking one item over another item. Right click will return the picked item to the inventory bar. Combinable items are indicated by a red cursor and message seen at bottom edge of screen. Right click of an item also describes the item. To switch main character; click on the picture of the other character seen at top left of the screen. Hints: A dialogue or cutscene can be skipped by clicking on the skip (arrow-door) icon. Double clicking on an exit (door) icon will transfer to next location immediately. The ESC key also skips a dialogue. The spacebar key shows all the active spots in the screen. Talk to characters often; they might have new info. 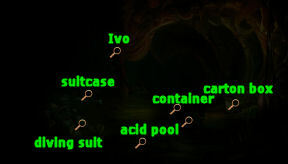 Examine active spots several times and check the descriptions of the items picked up. In Aventasia, there is war between the dark army of the Shadows and the Alliance of free people. Mortimer MacGuffin, an old archeologist writes his findings. In a book brought back from Grindel Mountains, MacGuffin found a travel report of a fairy researcher. The fairy was stranded on an island in the Western Seas and made drawings of the temple ruins on the island. MacGuffin translated the runes of the temple walls. He found the entrance to the temple that partially sank to the bottom of the sea. He found the "key" in the book. The temple might hold the legendary artifact. Legend states that whoever calls the artifact his own determines the fate of the world. MacGuffin has sent Beetle to deliver a letter to Master Alistair, the arch mage of the humans. Munkus the son of Mortroga appears inside the house and takes MacGuffin prisoner. MacGuffin refuses to reveal where he has hidden the key. Playing as Ivo: Ivodora Eleonora Clarissa is a Princess of the Silver Forest Realm. Ivo sees MacGuffin taken by the Shadows and loaded on a transport dragon. Ivo jumps to hold on the tail of the dragon. Look at the rope attached to the middle of the dragon. Click on the rope to get Ivo to swing to the platform that holds MacGuffin's cage at right. Examine the transport cage. Speak to the gremlin. MacGuffin tries to give the ring to Ivo and tells her to deliver it to the arch mage. She is to inform the Arch mage that the book that holds the information is in his secret cellar. Select any or all dialogue. The plan is to release MacGuffin when they fly over the White Ridge Mountain that is covered with snow and is on the way to Mortroga's fortress. Look at securing rope. The rope is too tight. Look at support strut at top left of the dragon. Speak to the gremlin and learn about Munkus, Beetle, the plan and the support strut. MacGuffin gives a bullwhip to Ivo. Use the whip ala Indiana Jones with the support strut. Climb up to the support strut. Ivo is now on top of the dragon and outside the transport room. Hear Munkus talk to Mortroga. Munkus wants IT. Look at the weapon stand across from Ivo. She can't reach it without being seen. Look at the box right of Ivo. Search through the carton to get a fish hook. Look at the flag left of Ivo. Take the wooden baton-staff. Combine the wooden staff with the string with fishing hook to get fishing rod. Use the fishing rod on the left sword on the weapons stand to fish for sword and get sword. Climb down the side of the dragon at right. Speak to the gremlin. Inform MacGuffin about the sorcerer and learn more about IT, the artefact. Cut through the securing rope above the cage. See Ivo cut the cage. The transport room also falls over the other side. Munkus is on top of the dragon. Ivo jumps off the dragon. Playing as Wilbur: Wilbur Weathervane is a gnome that works in a pub at the foot of the White Ridge Mountain. He daydreams of magic. Wilbur is ordered to teach the house robot to catch rats that might destroy the hops that is used in the pub's beer. X-100 house robot: Look at the wooden box right of Wilbur and try to open it. Talk to the Master Brewer at the bar and learn about the other dwarves that left to fight in the war. Take the crowbar from the top of the bar left of the Master Brewer. Open the box with the crowbar. Read the user manual. The X-100 has firstly to be fed disgusting remains of food. Then the robot has to be fed the rats DNA. Get food for the robot: Go left into the kitchen. Look around in the kitchen. Look at the emblem at top of the archway door. Learn that this pub is where the dwarven army was located. Look and try to take the cooking pot at the foreground. It has slime. Look at and take the kitchen waste in front of the window. Look at and take the net under the counter in front of the window. Look at and take the rubbish right of doorway. Take the empty coffee pot from the stove. Exit the kitchen. Look at the chair and the map on the wall right of the kitchen door. Get Rat DNA: Look at the rat and rat hole by the bar. Examine rat hole. Take the rat's fur from the splinter made by the rat chewing the wood. Train X-100: Use kitchen waste or rubbish on robot. Use rat's fur with robot. Watch what happens. Problem solved. Speak to Master Brewer to call it a day. Leave the pub to go outside. It is snowing outside. From the sky, MacGuffin's crate drops in front of Wilbur. In haste, MacGuffin gives the ring to Wilbur to bring to the arch mage at Seastone. MacGuffin is picked up by the dragon again. Wilbur says he needs help and to ask granddad or the brewer for advice. Granddad: Look at and enter the gnome hole where Wilbur's family lives at bottom of screen. Look at the family photo on the wall at right and learn about Wilbur's family. Look around the room. Go down the staircase at right. Talk to grandpa. Grandpa wants a password. Being an old military man, choose "nuclear first strike". Talk to grandpa again. He explains that Wilbur should collect the equipment, while he sorts out the transport. The equipment needed are: helmet, map of area and parachute. Continue the dialogue to learn about the arch mage. Cellar: Check the vice at left and the covered machine. Look at and take the silver elven rope at foreground. Look at and take toolbox right of the covered machine. Look at and take extendable arm right of toolbox. Check the submarine, scrap and the locker. Front room: Go back up. Check the chemistry experiment at the foreground. It is mum's experiments. The flower pot doesn't have anything planted there. Look at and click twice at the strange ball on the floor - mechanical flying fish Nemo. See it fly around. Look at the large metal gate and the levers at left. Use left bedroom lever, Meggie's lever and the third from left gnome room. Wilbur's room: The third from left lever opens Wilbur's room. Look at and take tennis racket from under the bed and rucksack from wall. Kitchen: Use the rightmost lever to open the kitchen. Look at and take scissors from knife block. Look at and take blue bottle of antibacterial kitchen cleaner. Open the kitchen bottom cupboard and take the vial of super fertilizer. Look at the grain mill at right twice to take barley grains. Get parachute: Look around outside. Look at and take the roll of tarpaulin under the scaffolding at right. Combine the tarpaulin with the elf rope. Done! Combine the tarpaulin with rope with the rucksack. A parachute! Get map: Go back inside the pub-dwarf bastion at left. Go left of bar. Check the map above the napping Master Brewer. Talk to the Master Brewer napping on his chair. The Master Brewer doesn't believe the ring's importance and doesn't want to give the map. The Master Brewer goes back to sleep. Use the scissors taken from the kitchen on the Master Brewer's beard. Go right and feed kitchen waste or rubbish (whatever is left in inventory) on robot. Feed Master Brewers DNA-beard on robot. Watch the robot attack the dwarf. They fight in the kitchen. The Master Brewer celebrates his win at the bar. Go left and take the map from the wall. Get helmet: Go in the kitchen. Look at-take the cooking pot with the slime at the foreground. Wilbur doesn't take it because of the slime. In inventory combine the extendable arm with the anti-bacterial kitchen cleaner. Use extra strong anti-bacterial kitchen cleaner on an extendable arm on the cooking pot with the slime. Take the cooking pot - helmet for heroes. Granddad: Go back to granddad at the cellar of the gnome hole. Speak to colonel granddad. Report! Granddad wants nitroglycerin substitute like dwarven ale and a part for his machine - cog. Get cog: Wilbur recognizes the cog granddad wants. Go back upstairs and see that Nemo, the flying fish is still flying around. Note one of Nemo's eyes. Try to catch Nemo. In inventory combine the net with the tennis racket frame. Use the homemade net on Nemo. Gotcha. Use the tool box with Nemo. Nemo wiggles too much. Go back down and go left. Use Nemo on the vise. Use toolbox on Nemo to get cog. Get dwarven ale: Exit the gnome hole and go to Master Brewer at the dwarf bastion. Talk to Master Brewer. Learn about dwarven ale and the brewing. The brewer needs crystal clear mountain and hops and malt. Malt-barleycorn: If you haven't taken it yet; get barley grains from the grain mill at the gnome's kitchen. Get crystal clear mountain water: Exit the pub. Look at and take the icicle hanging from the bottom rung of the left scaffolding. In inventory, combine the icicle and the empty coffee pot from the kitchen. Go to the kitchen of the pub. Place the coffee pot with icicle on top of the stove. Take the coffee pot with crystal clear water. Get hops: Talk to the Master Brewer about where to get hops. The rat took the hops. Look at rat hole. Wilbur gets a single hop. Give the single hop to the Master Brewer. One hop is not enough but you can plant it for next year. Go back home to the gnome hole. Plant the single hop in the flower pot at left. Use super fertilizer on hop plant. Harvest the hops. Master Brewer: Go back to Master Brewer and talk to him to give all 3 ingredients: water, hops and barley. The Master Brewer gives the dwarven ale. Wilbur explains about his quest and want of adventure. Master Brewer wishes Wilbur his best. Granddad: Go back to granddad and talk to give him the cog and the ale. Wilbur is inside Betsy II. Granddad gives Wilbur his old aviator goggles. Fire! See MacGuffin led by Munkus towards Mortroga's throne. Mortroga wants Ivo the elf watched. Playing as Ivo: Ivo is in front of MacGuffin's home. She wants to find the book at the secret cellar first before the baddies get them. Tschiep-Tschiep, the bird doesn't want her to do so. Look around at the yard. Check the well at right; the gable window that is shuttered above the doorway at right of house and the undergrowth at left of the yard. Check the stove and the stone mill right of the stove left of the door. Enter the house. Check the frame on left wall that has a broken mirror. Examine the wooden tub right of the doorway. It has MacGuffin's laundry. Look at the square above the doorway. Check this side of the fireplace. Mummy: Open the sarcophagus and talk to the mummy. That is quite a conversation. Look at the tool bag in front of the desk. Take the sieve. MacGuffin's diary: Look at and read the book on the desk. Learn what MacGuffin wrote before he was taken away. Read the book again and learn how the book was obtained. Look at the pile of documents right of the book. Take the documents. Wooden box: Check the stone head right of the desk and the wooden box on top of it. The box is locked. Stone chest: Look at the stone pillar at bottom of screen and the stone chest (Ark of the Covenant) beside it. Open the stone chest and see sand inside. Search through the sand. Use the sieve from tool bag with sand in chest. Get little brass key. Wooden box: Go back to wooden box on top of stone head. Use the key on wooden box. Get a paper inside the wooden box. It says something about ghost in the machine that knows the secret of the house. Look inside the wooden box again and get hexagonal stone disc. Stone pillar: Go to the stone pillar left of the stone chest. Examine the socket on top of the stone pillar. Use the hexagonal stone disc on the socket. See a statue rise up. Check the cup and then the statue. Talk to the machine. Get aromatic beans. Read the note from the wooden box again. Back out of close up by clicking on exit at side of screen. Tschiep Tschiep: Speak with the bird on top of the scarecrow. Aromatic beans: Use the aromatic beans with the stone disc-mill. Grind the brown beans to get aromatic powder. Water: Go to the well and use the crank handle. The rope breaks and the bucket is down in the well. Go to the fireplace-stove. Take the watering can left of the stove. Tie the watering can on the rope of the well. Ivo takes the watering can full of water. Hang the watering can on the holding bracket of the stove. Take a stack of wood left of the stove. Place the firewood in the stove. Place the unimaginably valuable documents in the stove. Look under the flower pot on top of the firewood. Get a firestone-flint. Use the flint with the paper on the stove to light a fire. Turn the holding bracket with the watering can over the fire. When the water boils, swing the holding bracket out and take the heated watering can. Stone pillar: Go back inside the house to the stone pillar. Look close at statue-machine. In inventory combine the heated watering can and the aromatic powder. Pour the fuel for the machine into the cup. The ghost (monkey) takes the fuel-cup of coffee. Ivo talks to the machine about the secret cellar. A stairway opens up on the floor. Check the secret cellar: Go down and look around the cellar. Examine the mural <grin>, little stone figure and the opening on the floor. Take the wooden staff at foreground and the garden shears on top of the crate. Get light to the cellar: Go upstairs and outside. Use the garden shears on the undergrowth left of the house. Examine the gravestone of Kinski. Look at the garret window at right side of house. Use the wooden staff on the window to open it. Enter the house. See the ray hit the broken mirror frame at left. Take the small silver shield on the mantle of the fireplace-stove. Place the shiny silver shield on the broken mirror frame. See the light beamed down to the cellar. Go down to the cellar. Place the wooden staff on the opening on the floor. Adjust the stone figure at left 3 times to get the light beam hit the top of the wooden staff. Check the grilled gate with 3 gems at right. Inside is the book. Get the ruby: Go upstairs and open the sarcophagus. Talk to the mummy. Mortimer asked him to hide the jewel of the staff. The mummy gives a test to be sure that Ivo is a friend of Mortimer. Kinski is the cat's name. The answer is 234. Ivo turns the table on the mummy and gets the ruby. Open the gate: Go down to the cellar. Insert the ruby on top of the wooden staff. See the light hit the 3 gems and the gate opens. Read the secret book. Learn about the Artefact of Divine Fate. Ivo will take the book to the arch mage at Seastone tomorrow. Playing as Wilbur: See Bartholomew the guard taking a break. Wilbur drops from the sky and hits the town wall. Wilbur talks to Bartholomew Anton Shieldhand, the town guard. Bartholomew explains that Wilbur is not allowed to enter the upper town where the arch mage tower is located. The town inhabitants are gone. Enter the gate and look around. Wizzard: Check the Master Markus Mage School door. The signs are covered with cobwebs. Knock on door. No one home. Market stall: Look at the market stall at other side of road. Looks like nothing has been sold recently. Go right. Check the cartons, cart and sewer drain by the road. Continue on the road until the gate to upper town. Bartholomew, the town guard: Talk to Bartholomew Shieldhand and find out that only people with invitations or mages with diploma are allowed at upper town. You have to show a mage diploma to prove that you are a mage. There is a mage teacher at the tavern playing a role playing game. Look at the coat of arms and basket with a giant sandwich. Dancing Boars Head Tavern: Go back down to lower town. Check the sign of the tavern. Enter and look around. Master Markus is too engrossed in the game to talk to Wilbur. Check and then take the preserving jar on the bar counter and the saw on the tool box behind the mage. Server's room: Now that you have a purpose, you can enter through the Server's room right of the RPG machine. Look around. See the hairy demon - monkey operating the RPG machine. Check the chair the demon is standing on. Check the chair at the corner and see that it is the similar to the server-monkey's stool. Check the safe for saved games. Hahahaha. There's an inkwell-jar on top of the table. Crash the game: Use the saw on the chair at the corner. Annoy the demon by messing up the files cards in the wooden box. See the monkey rearrange the wooden box. Mess up the file cards again. Immediately click on the stool he stood on and Wilbur will swap it with the sawed stool from the corner. The monkey-server falls on the floor unconscious. Hear the 2 gamers complain when the machine stops working. They write technical glitch complaints and submit them. See the complaint papers fall in the trash can. Crash the game part 2: One more sabotage needed. Exit the room and the tavern. Go right to Shieldhand the guard. See him eating a banana. Talk to him twice and learn that he helps himself to the banana delivery sent by the RPG company. Continue talking until you threaten him by informing the gamers at the tavern. Get a banana. Go back to the tavern and distract the demon monkey with the banana. See that it only got the 2 gamers to write another complaint. Crash the game part 3: Exit the tavern and the town to be outside. Check the sign, the bunny and the flat stone. Lift up the flat stone. See bugs. Use the jar on the flat stone to collect beetles. Go back to the tavern and the demon server. Use the jar of beetles on monkey. See the monkey do what monkeys do with insects. Master Markus Mage School: Go to the Mage-wizzard school next door. Learn that Markus and the arch mage are not really friends. Master Markus cannot just give a diploma; Wilbur has to become a mage graduate. Three things needed: mage robe made of magical fabric, a magic wand and pile of gold. Robe: The mage robe can be sewn by Wilbur. He needs magical fabric, needle and thread and pattern. Magic wand: The wand fits to the mage not the other way around. Bill the merchant has wands. Heap of gold: The mage wants to be paid for teaching Wilbur. He recommends talking to Wupperman the showman. Wupperman is very rich but does not work and does not steal. The showman can be found at meadow. Master Markus gives a postcard-map that can be used to jump from one place to another. The mage has glasses that can see hidden script. Search the room: Look around the room. Check the board and the bookcase by Markus. Look around at the kitchen at the corner. Check the strange mirror. Check and take the crystal ball on the shelf by the door. Check the carton left of the door. Search the carton to get needle and thread and 3 potions (red, blue and green). Exit the school and see the merchant and the King of Thieves-rat are in a fight. Talk to Bill the merchant. Business is down and the thieving rat stole everything from him when he was playing WOB. The merchant wants Wilbur to kill the rat and bring the mask as proof. He will give 3 things from his store. Buy something. No magic wand fits Wilbur ala Harry Potter. Buy something again. The magically treated cloth cost 2 gold per thigh. It is too expensive. Go to the sewer-drain in front of the tavern. Examine the entrance to the sewer. Be small: Drink the 3 potions taken from the carton at the mage school. Drink the last-green one again to make Wilbur small. Try to enter the sewer but he is not small enough to fit inside the drain. Talk to the merchant. The merchant gives the shrinking ring after Wilbur tells him that he needs it for the King of Thieves. Enter the sewer: Go to the sewer entrance. Put ring in finger; Wilbur is still not small enough. Drink the potion; now enter the sewer. Talk to the rat to learn that he steals to take care of his family and friends. Learn about his newly arrive Uncle Juan who was attacked by a robot when he was up north. LOL. Tell him about giving them food. The rat can help Wilbur by bringing him things. Exit the sewer. Find a generous amount of food for the rats: Go right to Shieldhand the guard. Take the sandwich out of the basket. Talk to Shieldhand about the sandwich. They will play Master of Dragon Slayer's Defender card game. One can only win if one has good cards. The guard lends Wilbur some cards. The guard wins and is still the unbeaten champion. Get a very good card: Enter the sewer. No need to be small; automatically shrink. Talk to the rat about the sandwich and the card game. Exit. Talk to Master Markus at the school about everything. Tell the mage about the card game. He gives a half card that is the mage's best one. Ask about the mirror. It is the gateway to another world - Kingdom of the Dead. Only ghost can go through the mirror. Exit and hear the rat call Wilbur. The rat gives him a half card. Auntie Juanita said that the owner killed himself after he dropped the card in the drain. Win the card game: Enter the tavern. Take the sticky tape in front of the console of the RPG machine. Click on a card and then the sticky tape in inventory to stick the cards halves together to get a supercard. Enter the server's room and take the ink pot from top of the safe. Go back to Shieldhand and talk to him. Wilbur shows him the supercard. The guard gasps and says that the card is damaged and it cannot be used. He knows the rules. Go back to Master Markus and tell him about what Shieldhand said. The mage gives Wilbur the rule book to show the guard. Go back to the guard and talk to him. They play the game and Shieldhand loses. Wilbur will not mention about the game again, losing and the guard gets all the cards including the supercard. Get the sandwich. Give the sandwich to the King of Thieves: Go back to the sewer. Push the sandwich in the sewer. Do not enter with the sandwich or it will become small also. Then enter the sewer to talk to the rat. That sandwich is enough to feed the rats. They will stay until Wilbur gets his diploma and then they will leave. The King of Thieves gives his spare mask. Merchant: Go to the merchant and talk to him about the mask. Collect one of 3, er... 2 rewards. Ask for the magically treated material. Rat: Talk to the rat again and ask to get something. Ask for wand, cutting pattern and pile of gold. The rat will look for wand and cutting pattern but no help for pile of gold. Exit the sewers. Exit through the gate and then come back to the sewer. See a white handkerchief sticking out of the sewer. Get the robe: Reach into the hole. Get a human child's mage robe. Click on the pattern in inventory and see Wilbur in mage robe. That looks familiar - Simon look-alike. Get the wand: Reach into hole again and get a magic wand. It works - it works! The showman: Check the postcard in inventory. Click on the meadow at bottom left. Speak to Willy Wupperman, the showman. He is really a fortune teller. The top prize for the wheel of fortune is a sack of gold. Try one game of wheel of fortune. Wilbur loses. Check the cage of pigeons at bottom right. Take pigeon feather. Check the empty cage. The sign says Ziggy, the invisible pink squirrel. Check the crazy hairy thing at left. The sign says Bertram, the world's fattest hamster. Get good predictions: Talk to the showman about predicting the future. Wilbur gets a reading. Then ask about the cages. Learn about the animals and the use of pigeon as carriers of his predictions. Talk to Wupperman about Ziggy, the invisible squirrel. The showman will walk over to the cage. When he leaves the table, replace his crystal ball with the one from the mage school. Ask him to predict the future again. This time he goes into a trance. He cannot talk but can only gesture yes or no. Wilbur will not fulfill his mission with the arch mage but it is not for naught. Bad things will happen and he will die. Ask him to predict the future again. Again he goes into a trance. Ask questions to see that he will answer only several questions before waking up. Find out he will answer only 5 questions. Predict the result of the Wheel of Fortune: Talk to the showman again about predicting the future. Wupperman goes into a trance. There are 4 colors on the wheel of fortune: yellow, red, green and blue. To win the wheel of fortune, you have to give the correct color the wheel will point to 3 consecutive times. The trance - true prediction will only be answered after 5 questions. First question should be: Is it color 1 or color 2? Second question should be: If yes from above, ask about one of the colors stated; if no, ask if it is one of the colors not mentioned. Deduce the correct color of the first spin. Move on to the next spin. Third question is similar to first question. Fourth question is similar to second question. Deduce the correct color of the second spin. Fifth question: The question is similar to first question. Then the showman wakes from his trance. You have to guess the last color but you already eliminated 2 of the colors by his response. Play the Wheel of Fortune then. Keep on playing until you win the game. Always ask for another reading from the crystal ball. More often than not in my gameplay, the next color is closest to the second reading than the other farther choice. Get a bag of gold. Master Markus: Jump to the town. Talk to Master Markus at the school about the mage robe, magic wand and give him the bag of gold. Wilbur is now Master Markus' apprentice. He says that to be a mage, Wilbur has to pass 3 tests. The tests are: brew magical potion, have a magic artefact and cast a spell. Ask the mage about all 3 tests. Brew magic potion: Wilbur has to get ingredients and mix them in the cauldron. Get a recipe from the bookshelf. Magic artefact: Good artefacts are rare. The mage will evaluate the artefact if it is good enough. Learn about Balthasar the Brittle. He took his artefact with him when he died. The mirror belonged to Balthasar. The artefact is an amulet. Wilbur says he will get that amulet. Only ghost can go through the mirror. One has to die to go through. The mage mentions that someone at the Swamp of the Dead can help Wilbur. Cast a spell: Wilbur has to cast a real spell like make one disappear or transform them into something else like a sheep, the mascot of the order. Jump to the meadows and talk to Wupperman, the showman about learning a spell. He knows a magic trick that he can teach Wilbur. He needs a top hat and a rabbit. Take the carrot from Bertram the hamster's cage. Find a recipe: Back at the Mage school - Go to the bookcase close to the mage. Get a book and Wilbur will get a recipe for a Power Elixir that gives strength and confidence. See the list on the left side of the screen. You can check the list in inventory. Go to the corner kitchenette. Check the clay pot to get peppermint. Check the press used to extract substances. Examine the small casket beside the press to get asthmatic fat grubs. Take crystal vial from end of the counter. Check the stone mortar on the mage's desk. Exit the school. See Munkus talk to Mortroga. Mortroga says the elf has the old book and that the gnome with the ring is already in town but has not reached the arch mage. Munkus has an idea that will stop the gnome from reaching the arch mage. Rat: Enter the sewer and talk to the rat to ask him to get things. The King will get stag beetle antler and will signal Wilbur when they have it. He cannot help with other ingredients, spell and artefact. Take mouldy slime from the water in front of Wilbur. Exit the sewer. Exit the town and then go back to the sewer. See a white handkerchief. Take the stag beetle antler from sewer. Use the map to jump to the Swamp of the Dead. Check the lantern and stone head. Check the half sunken tree. Examine the red plant on the armpit of the tree. Take the red devil's armpits. Look at the skeleton on the swamp at right. Take a bone to get bone worms. Examine and take the bluish ghost mushroom on the floor left of the entrance. Take a piece of the heavy rope by the bookstand to get thin rope. Look at the top hat on top of the bookshelf. Check the Book of the Dead on the bookstand. It is empty. Death: Talk to Death wearing fuzzy pink bunny rabbit slippers. LOL. No one dies in an adventure game unlike an RPG. Learn about the Balthasar's mirror and the Book of the Dead. Death can only kill the ones whose names are entered in the Book of the Dead. Then he has to balance the dead's name with the ones killed or the auditors will catch it. Jump back to town. Enter the mage school. Use the mouldy slime from the sewer on the press at the kitchenette to get mouldy slime extract. Use the stag beetle antler from the King rat on the mortar and pestle at the mage's desk to get stag beetle antler powder. Check the ingredients-recipe. It is now time to brew the potion. Follow the directions stated at top right of screen. The ingredients are labeled when the cursor is over it. Thanks, Carla! Step 1: Put ghost mushrooms (top left) into the pot and stir until the water turn green. Stop stirring. Step 2: Add mouldy slime extract (bottom green) and stir anti-clockwise until the potion turns pink. The potion goes from green to black to yellow to pink. Step 3: Add the red devil's armpit (middle left red) and wait until little red bubbles appear. Then stir clockwise as quickly as possible. Stir rapidly in clockwise direction several times until the next step. Step 4: Sprinkle the stag beetle antler powder (black bottom right) into the potion. When the potion turns blue for the third time, immediately add the bone worms (top right pink). Step 5: Then add the asthmatic transfat maggots. Stir the potion (normally) clockwise 4 times (change to white), anti-clockwise 2 times (color change yellowish) and then clockwise 3 times. Step 6: Finish it off with the peppermint leaves for that fresh minty flavour. Add a few leaves and stir until the potion turns a golden yellow colour. The yellow power elixir is now in the vial. Talk to Master Markus. He checks the elixir and approves it. Exit the mage school and talk to the merchant. Swamp of Death: Use the map to jump to the swamp. Enter the ship. Talk to Death about needing to be a ghost and the top hat. It was his gravedigger father's hat. He would not lend the hat. In inventory combine the inkpot and the pigeon feather. Wilbur will now say that he can write on anything. Use inkpot or feather to write on the Book of the Dead. Death scolds Wilbur. Death needs to be distracted. Check the stove and the Spliss poster by the bed. Merchant: Jump back to town. Go to the merchant and see that he is packing up to leave town. Ask him about your other rewards. He refuses. Tell him he won't be your friend anymore. The merchant gives Wilbur a sack. Open the sack in inventory and see that it contains fireworks. Distract Death: Jump back to the swamp. Enter the ship. Place the fireworks shells in the stove. The fireworks explode in the stove and Death stands up to check the stove. Take either the inkpot or pen and click-write on the Book of the Dead. Wilbur enters his name in the book. Talk to Death and tells him that his name is there. Death becomes deliriously happy. Fare thee well, Mortal. Wupperman's prediction comes true. Wilbur is a ghost: Look at the mortal Wilbur while Death smokes a cigarette. Exit the ship and Wilbur will go to the mage school. Try to talk to Master Markus. Enter the mirror. Hours later, Wilbur comes out with the powerful magical amulet. Go back to Death. Talk to Death until he brings Wilbur back alive. Get the top hat: Wilbur tears the page off the Book of the Dead. Talk to Death again as live Wilbur about a new job; like being a contract killer. Death becomes interested in burying people alive. He will partner with Wilbur. Wilbur's job is to get money to finance the business. Jump to the meadows and Wupperman. Talk to Wupperman about the business venture. Wupperman sees the venture as an excellent possibility in the future. Go back to Death at the swamp. Talk to Death by the swamp doing a trial burial. The coffin is in the ground. Death wants Wilbur to climb in the coffin. Wilbur convinces Death to have the honor. Death makes Wilbur hold his top hat. Death is buried alive. Get a rabbit: Jump to town and then exit through the town gate. Try to catch the rabbit. Knot the thin rope taken from Death's home to the tree. Wilbur makes a snare. Lay the carrot taken from Bertram in the snare as bait. Noooo... Thankfully, the rabbit was only knocked out. Spell: Go to the showman. Talk to the showman about rabbit and top hat. Wupperman shows how to do the rabbit and hat trick. Wilbur's conscience gets tweaked. Jump to town and talk to Master Markus about the elixir, the powerful amulet of Balthasar and the spell. Wilbur does the magic trick using his powerful wand. He nearly changed the rabbit into a sheep. It has a walkthrough!!!! The arch mage is his brother. Wilbur has a friend in Master Markus. Wilbur gets the mage diploma and is now wearing a sorcerer's hat a la Simon. Exit the school and go right. The King of Thieves congratulates Wilbur and says goodbye. Wilbur is always welcomed by the rats. Go to Shieldhand, the guard by the gate. Talk to the guard. Arch mage: Shieldhand brings Master Wilbur to the arch mage. Wilbur shows the ring to the arch mage. In the manner of Star Wars, MacGuffin explains what he found - the location of the most powerful artefact - the Artefact of Destiny (Divine Fate) bestows good fortune to the holder. It will grant the holder everything he desires. It is found in the temple in the Island of Sordia. The arch mage orders Shieldhand not to mention the news to anyone and dismisses him. He orders Wilbur to find 2 companions that will accompany him to the island. The arch mage is to research where the island is located. When Wilbur leaves, the arch mage changes to Munkus. Nate and the airship: Wilbur is at the airship dock. See the 2 cages with a human and a pink something guarded by an Orc. Look at the Orc. Learn that Ma'Zaz the female Orc is a bounty hunter. She is waiting for her supplies from Bob the merchant. Check and take the net at foreground. Try to take the rope and get scolded. Nate is the human in the cage. When Ma'Zaz gets into an argument with Nate; then take the rope. Talk to Nate. He is a freelance treasure hunter and owns the airship The Mary. Wilbur finds one companion and a transport. He needs to get pass the Orc lady. Master Markus: Jump to the lower town (lower part of town in the map) and go to mage school. Read the note on the desk. Master Markus is with his brother the arch mage at the Wild Thorn Pass battlefield. Marcus Maria Alistair leaves his magic spectacles to Wilbur. Upper town gate: Walk to the upper town gate and Shieldhand. Overhear that Ivo wants to see the arch mage about a book and was not allowed. Talk to Ivo completely. Look at Tschiep-Tschiep. Check the grapes of the poison ivy at right of the screen. Bring Ivo to upper town: See that the airship is close to the walkway above the gate. Use the rope on the pillar on the right side of the screen; just above the upper town gate. See Ivo climb up the rope. Wilbur and Ivo talked. Wilbur brings Ivo to the arch mage's office and shows her the star wars-MacGuffin's ring. Ivo is in. Look around the room. Check the Encyclopedia Phantastica by the window. It is large and blank. Use the magic spectacles left by Master Markus. Read about Sordia and about the arch mage. Wilbur didn't like the arch mage. Look around. Check the rolled papers above the bookcase. He can't reach it. As Ivo: Change to Ivo by clicking on top left icon. Get a map from top of the bookcase. Check the large map on the wall twice. Read the gremlin's book in inventory. Learn that the fairy explorer who found the temple started the expedition from a town called Krun Pak. Check the map again. Ivo and Wilbur cannot find Krun Pak. They realize that it was an old Shade's name. As Wilbur: Check the Encyclopedia for Krun'Pak. Find out that the town was called Redstonebury. Check the large map on the wall. See the compass. Go WNW from the central compass to see Seastone. Go north from Seastone and see Redstonebury in the middle of the north island. Click up (north) to foot of mountains. Click right (east) to plain. Click to road (northeast to broken lines). Go up (north to river (solid lines). Follow river to mouth (east to end of solid line). Go down to bay (south to small indent in map). Go NE to the second (far) island. They now need the transport. Exit the arch mage office to be at main square. Take the rope from the pillar. As Ivo: Speak to Nate and then the Orc. Ask Ma'Zaz for the human. Have a contest of arm wrestling. Ivo loses. As Wilbur: Give the Ivo the power elixir. As Ivo: Click on power elixir in inventory. Ivo drinks the elixir. Challenge the Orc to another arm wrestling contest. As Wilbur: While Ivo and the Orc are arm wrestling, use the rope on the beam-bracing above. Use the net on the plank where the Orc was standing earlier close to the cage. Look-click on rope and then click the rope cursor on transport bales. Click on rope attached on bale and then click the rope cursor on net to attach the rope. It looks like a good trap to me. Look at Ivo and wonder how long the elixir will hold. Ivo wins the arm wrestling and the Orc returns to her usual position by the cage. Push the transport bale and can't. Wilbur cries for help. Ivo helps Wilbur with the transport bale. The trap failed but got the Orc seeing birdies. Ouch! Talk to Nate. After some discussion, Captain Nate Bonnett is part of the company. Playing as Ivo: The companions are at the entrance of the Temple. Nate is going to repair the ship. Ivo tells Wilbur to stay here outside the temple to keep him safe. The bird scolds Ivo. It was for Wilbur's own good. The temple side door: Look at the temple's side door. Check each of the 4 little alcoves at sides of the door. The alcoves are for creatures of air, fire, earth and water. Check the sparkling lights flying at left side over the ledge. They are rare fire fairies. Click on them again and learn that they need nectar to maintain their energy. Check the beehive at right of temple door. Try to take some honey. You need a container to hold the honey. Talk to Nate by clicking at top right of screen. He was snacking. He throws a glass jar at Ivo. Then Nate naps. Talk to Tschiep Tschiep and ask him to help distract the bees. When the bees are away from the beehive; use the empty jar on it to get a glass jar with honey. Go left to the ledge. Use the jar of honey on the ledge. After a bit, Ivo collects the jar with a fire fairy. Take the rope and the bucket of water left of the door. Check the dry earth at center of the ground area. Use bucket of water on dry earth. Take the worms that rise to the wet soil. Look at the fish bone at left ledge. Pick up a fishbone. Pick up the branch left of Wilbur. In inventory combine the fishbone with rope; then with branch and lastly with worms to get fishing rod. Use the fishing rod on the ocean at left. Ivo asks Wilbur to catch a fish. Since Ivo is from the mountains, he asks what to do. Ivo said to cast the fishing rod. Wilbur throws the fishing rod into the water. He sees a fish get caught. Ivo climbs down to get the fish. The fish is in the bucket of water. Talk to Tschiep Tschiep about creatures of air alcove. The bird finally agrees to enter the alcove later. Place the creatures of earth, water and fire in their respective alcoves. Now talk to Tschiep Tschiep. The bird flies into the alcove at top left. The door finally opens. Eek! Tschiep Tschiep leaves. Ivo asks Wilbur and Nate to come inside. After some discussion, Wilbur and Nate fall down into a dark trap. Check the others: Look down at the abyss. Change to Wilbur and look around. It is dark and there's a stone slab behind him. Change to Nate and look around. It's too dark to see anything. As Ivo: Look at the stone rings on the door at left. Go deeper into the temple - next room. Look around. Check the water and see jellyglowfish. Take the machete beside the skeleton. Check the 2 grimacing face on the end of the top and bottom bridges. Check the middle door with the crystal. Check the 2 ledges and see something shining up on the ledges. Leave the entrance room. Use the machete on the roots hanging over the abyss - broken floor. Swing to the other side and exit to the outside. Check the little alcoves. The fire fairy, worms and the fish are gone. Take the glass jar from top right alcove and bucket from bottom right alcove. Go back inside. Swing to the other side. Go back to the entrance of the inner temple at left. Use glass jar on water to catch a jellyglowfish. Place the jar with jellyglowfish in bucket. Combine the fishing rod with bucket with jellyglowfish. Use the jellyglowfish-jar-bucket-line on the abyss and Wilbur. Wilbur checks the stone slab that has symbols of: something that looks like a snail with a long neck, a fish without a head, a branch and a star. Nate asks for the light and sees a passage to the left. Look close at the 4 stone rings that can be turned. Turn the rings to show what Wilbur saw on the stone slab (from top to bottom): something that looks like a snail with a long neck, a fish without a head, a branch and a star. Press the button at right. That should be it. The door beside Wilbur opens. Bring Nate up to middle level to open hatch. As Wilbur: Go left and look around. See a stone and 2 platforms. On the left is a hatch with a wheel that cannot be opened. Someone stronger can do this. Stand on the right pedestal and it goes down to lower level. The left pedestal goes up. Look at the head on the wall. Go left and go through door to see a wheel. It is locked to prevent people turning it. Leave the tunnel. Look at roots hanging on the ceiling. Click on roots twice to get Nate to help Wilbur climb up to middle level. Bring the right pedestal up: Stand on left pedestal and it goes down. The right pedestal goes up. Climb up roots again to be at middle level. Bring Nate up: Change to Nate and stand on left pedestal. Change to Wilbur and push the stone on right pedestal. Automatically, Wilbur stands on right pedestal. The combined weight raises Nate up to second level. Wilbur throws the stone away. Change to Nate and go left to the hatch. Open the hatch. Bring Wilbur up: Change to Wilbur and stand on the right pedestal. Change to Nate and stand on the left pedestal. As Wilbur: Wilbur is now at middle level. Change to Wilbur. Go left and crawl through the hatched opened by Nate. Climb the ladder to the top. Continue up one more level and be on the ledge at the entrance room. Ivo comes in and asks for the crystal. Wilbur throws the crystal to Ivo. Pick up the stone tablet by Wilbur. Leave the gallery to go back down to the top level. Climb out. Give the stone tablet to Ivo. As Ivo: Change to Ivo. Look close at the 4 rings. See the stone tablet at bottom right. Change the rings to be similar to the leftmost column of symbols. Press the button at right. See that the mouth at bottom level opens and a passage opens at middle level. As Wilbur: Change to Wilbur. Go left to tunnel and go down to middle level. Crawl through hatch. Enter the passage at the center and be at the other ledge. Leave the gallery, climb up ladder and go to Ivo by the 4 rings. As Nate: Change to Nate. Look at the face on the wall at bottom level and see a switch. Use the switch and see water pour from the wall to the pedestals to bring them up-down. Go left to the big wheel and see that it cannot be turned. It is latched. Change the rings to be similar to the middle column of symbols. Press the button at right. See the wheel at bottom level get unlocked. As Nate: Change to Nate. Get Nate to turn the wheel. The door closes. Change the rings to be similar to the right column of symbols. Press the button at right. As Nate: The tunnel where Nate is fills with water. Nate floats out to middle level. Climb the ladder and join the others. As Ivo: Change to Ivo. Go to entrance to temple at left. Insert the crystals on top and bottom grimacing faces. Stand at middle crystal and touch it. See that 3 people need to touch the 3 crystals. As Nate: As Nate, go to entrance to temple at left. Touch crystal of the top grimacing face. As Wilbur: As Wilbur, go to entrance to temple at left. Touch crystal of the bottom grimacing face. As Ivo: As Ivo, touch the middle crystal and the gate opens. As Ivo or Nate or Wilbur: Decide who will go through to the temple. Go forward and check the boat with skeleton. Take the paddle-board from the skeleton. Check the iron bar (Ivo and Wilbur cannot pick it up but Nate picks it up). Go left and look at the door at the end. Check the 2 holders planking the bowl. They should hold the crystals. Search the bowl. Take sardines in oil tin and a stone disk. Take round stones from the ground in front of the door with opening-gears on top. Open the drawer and take another stone disk. Look at the label of the machine at right - Goom - Tec. Stone disks: See that it has 2 stone disks on top of the machine. Use the stone disk in inventory that has a larger brown area at center on the stone disks top of machine. Then use the stone disk from inventory that has a smaller brown area at center on the stone disks of machine. The disks are now the same height as the shaft at the center. Turn the stone disks. See a close up of the disks. Each disk has symbols. See that there are 4 lights at bottom. 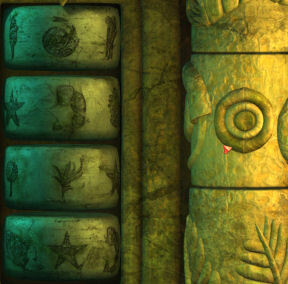 The object of the puzzle is to select the correct symbols on each disk; then press the shaft at center to get all lights green. If the light is green, there is a correct symbol at the correct disks. Find out which one by changing the symbols on each and then pressing the shaft at center. If the green light turns off, place that symbol back because that is the correct symbol at the correct disk. If you already found a correct symbol at correct place do not touch it anymore. If the light is yellow, there is a correct symbol but at the wrong disk. So check one symbol at a time on the other disks. Do this until all 4 lights are green. Press the shaft at center and see that all the machines are now powered. Press the large red button on the left. Exit and go to the main exit door and see it open. Exit and see that the other 2 companions are gone. Go to the exit to the outside. Hear Munkus give orders to the troll guarding the other 2 companions. Munkus goes to the inner temple. Follow Munkus to inner temple. See him try to open the door and place something as offering in the bowl. Enter the machine room. Prepare a trap for Munkus. Use the can of sardines on the floor in front of the bottom drawer. Use the paddle on the rotating machine with holes at right. Look at and then take the mail tube-cylinder on the floor. Go outside and use small stones at Munkus to get his attention. Go back inside the machine room and Munkus will follow. Munkus slips on the oil. Munkus rises up and gets whacked by the rotating paddle-board. Use the cylinder on the mail tube pipe at right. Munkus rises up and gets hit by the flying cylinder. Third time you're out! The machine door is closed. Go outside and search the bowl for the object Munkus placed in it. Take the mirror. Exit to the entrance area. Take the 2 crystals and the door is closed sealing Munkus inside. Go back to the exit to outside. Take the fishing rod propped on wall. Swing to the other side. Use the mirror on the troll. Go back outside. Click the fishing rod on the troll's club, the brown item right side of the troll. Then click on the 2 companions, to give them a sign to distract the troll. The prisoners taunt the troll. Use the fishing rod on the club. The rope is now strung in front of the troll. Use the mirror on the troll again. The troll falls into the ocean. Nate wants to leave immediately but after realizing that only the arch mage can keep him safe decided to wait for the other 2 to get the treasure. Wilbur and Ivo use the 2 crystals to open the door to the inner temple. They enter through the statue's mouth and the teeth close trapping them inside. As Wilbur - Get light: Playing as Wilbur. It's dark in here. Use the spacebar to see all the active spots. Go right and check the nothingness - take the carton box. Go to the center and take the container made up of metal and wood. Check the caustic liquid at bottom of screen. Check all the other hot spots. Use the container in the liquid at foreground. Open the box and see little packages. The little packages are full of dried jellyglowfish. Use the dried jellyglowfish with the container with liquid to get light. Ivo points to the artefact. They and the artefact are inside a monster. Check the barrel. Wilbur cannot use the barrel because there is no paddle. As Ivo: Change to Ivo. Use the barrel on their side of the stomach acid pool. See Ivo roll to the other side. Try to take the treasure chest stuck on the wall. Look at the hole, the horn and the gramophone machine at right. Take the board left of the barrel. Use the barrel to cross back to the other side. Give the board to Wilbur. As Ivo: Change to Wilbur. Use the barrel and see Wilbur paddle to the other side. Look around. Take the gramophone scratchloudner. Look at the metal horn. Blow the horn. Look in the smelly hole. Go down the smelly hole. Read what Wilbur finds and does down there. He gets a barrel lid and rope given by the mirror. Use the barrel to go to the other side and Ivo. Use the barrel lid on barrel and Ivo gets an idea. Ivo gets Wilbur to enter the barrel and she rolls to the other side. Get the artefact: Give the rope to Ivo. As Ivo: Change to Ivo. Use the rope on the stuck treasure chest. Pull the treasure chest from the stomach wall. Hear the monster's sigh of relief. Open the chest. See a smaller box that is locked. As Wilbur: Change to Wilbur. Look in the treasure chest and see another loudener - a cone. Talk to the monster: Look at the metal tube. Blow into the horn. So soft. Use the gramophone scratchloudener on the horn. Blow into the horn. Not loud enough. Use the cone into the scratchloudener that is on the horn. Blow into the horn. The monster talks. Talk to the monster. The monster releases the two adventurers. Ivo and Wilbur meet Munkus, Nate, Critter and the troll. Nate made a deal with Munkus. The troll holds Ivo while Wilbur tries to stop Munkus with his wand. Wilbur was suspended in the air by Munkus. Nate attacks Munkus. The amulet of Balthasar opens a portal. Nate and Wilbur with the artefact enter through the portal. Ivo tries to go through but was stopped by Munkus. Wilbur and Nate arrive outside a cemetery. A very angry Wilbur gets caught in the snare. Nate was knocked down by a black shadow. Nate wakes up in a Zombies' den. Talk to the 2 zombies. They are the Committee for the Humane Treatment of the Undead. Wilbur is now at the Orc camp. Nate tells everything to the zombies. They scold Nate for what he has done. Nate has to get Wilbur, free the elf and bring the artefact to safety. The zombie holding his head with a body that he cannot control is Gulliver. He can be found in his workshop. The one with the pillory is the Boss. Look around. Check the urns on the left. Take the piece of clothing-scrap of leather sticking out of the tomb behind the crying bride. The crying bride: Talk to the crying bride-water corpse. Learn her story about being left by her Maximilian who hoofed it. Check the sarcophagus of Maximilian's forbearers. There is a pool of tears in front of the crying bride. Chief Zombie: Go to front part of crypt. See a dripping candle and a grave beside it. Talk to the Boss-Chief Zombie with the pillory. A paladin did this to him and is outside waiting for him. The paladin wants revenge and would not listen to his apology. The pillory will open only when the paladin forgives him. Gulliver: Go to the worktable at left. Take the pot of glue, yellow paint and unbreakable string. Look at mechanical monstrosity. Talk to Gulliver with an Elvis haircut. Learn his story. The body below his head is not his; he borrowed it from Esther. The crying bride is waiting for Maximilian to come back or write her a letter. Leave the crypt. Take the red earth by the gate of the cemetery and the white mushroom at the foot of the dead tree at right. Esther: Talk to the head on a lance. It is Esther. Take the map on top of the hat boxes below Esther. Check the map in inventory. Paladin: Check the pennant top of the tent. Talk to the Paladin. The paladin spits every time he says the word zombie. Shaman: Go to the teepee seen at top left of the screen and the crypt. Talk to the minotaur shaman. The shaman Fast Foot is smoking plants to commune with his forefathers. Take the copper bowl left of the entrance and a feather of the headdress on the wall. Pick up the broken bellows by the entrance of the teepee. Open the chest and take the makeup-Indian ink. Leave the teepee. Go right of the crypt to the Orc camp. Look around. Take rotten boards from the side of the path and blue blossoms left of the gate. Check the juice press on the garbage heap. Look at and take the poster-sheet of paper right of the gate. Leave the mountains by pushing the gate and an Orc appears at watchtower. Talk to the Gorruck, Chief of the Bloodscythe Orcs. Wilbur is the bonus prize for their warrior contest. The main prize is a bottle of firewhiskey. Any warrior can enter and Nate wants to enter the contest. Go to the crypt and talk to Gulliver. One way to win the contest is to have the invincible kit do the fighting for you. The invincible kit is made up of the helmet, shield and the sword of power. Sword of Power: Gulliver says that if Nate helps with the making of his body; he will tell him where the sword of power is located. Gulliver needs a lung, heart and bolt of lightning to breathe life to the body. The others would know where the other 2 equipment are located. Helmet: Talk to Chief Zombie about warrior set. He will tell Nate who has the helmet if he can get the Paladin to forgive him. Shaman: Go to the teepee. Speak to the minotaur about the Paladin. Tell him that the friend regrets what he did but the Paladin won't hear any of it. The shaman will brew a sleepwalking potion. Nate will drink first and then get the Paladin to drink the rest. As the Paladin walk him to friend and get him to listen to the apology. He needs Paladin's hair, body fluid, clothes and something from his forefather. Paladin's forefather: Go to the inner part of the crypt and check the urns at left side. See one of the urns has the coat of arms of the Paladin. Take some of the remains of the Paladin's ancestor to get ashes. Paladin's clothes: Go to the Paladin outside. Check the chest at left with logo of the Pink Crusaders. Open the travel chest and take the pink pompom. Paladin's body fluid: Look at damp ground in front of the chest. Place the bowl on the ground. Talk to the Paladin about zombies. Pick up the spittoon. Paladin's hair: Then talk about Paladin's hair. Get Paladin's comb. Shaman: Go back to the shaman. Talk to the shaman and give him all the ingredients for the potion. The shaman prepares the potion and gives Nate the sleepwalking potion to drink. Paladin: Talk to the Paladin about a new drink. It has zero calories. The Paladin is full of mana. He hasn't used a spell in days. The Paladin gives Nate power spells: sdr/sdk/sdw. The Paladin drinks the potion. Enter the crypt as the Paladin. Paladin-Nate talks to Chief Zombie and after some threats by the zombie forgives him. Chief Zombie: Nate returns to his body. Go talk to the Chief Zombie. The helmet is with the earth pixies in the mine. 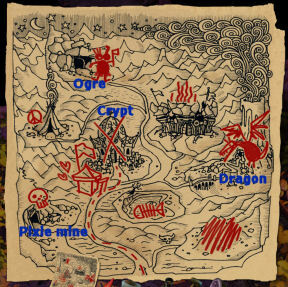 Use the map taken from the Paladin's camp and click on the mine at bottom left (one with the skull). Helmet: See Nate go down to the altar. The helmet talks to Nate. He styles himself as the prophet of their deity, Wuuzaaa. Learn that the pixies like glittery things. For the pixies to believe, the deity himself would have to fire the helmet. The helmet ordered the pixies to throw Nate out. First area: Go back inside the mine. Look around and see a water trough at left. If you get caught and thrown out - just come back in and be careful. Second area: Go through the opening at top of the screen. Go right to next room. Take key from table and dynamite from crate. Go back down to first area with water trough. Side room by first area: Go right to next room. See 2 pixies working here. There's a teddy bear on a chair and one of the pixies rubs it every now and then. The other chair by the other pixie is empty. Take the teddy bear and place it on the empty chair. Watch what happens. Go through the entrance beside the chair with the teddy bear. See a chest-box. Use the key taken from the other room on chest to get magnetic stone. Lit passage: Go to the second area above. Go to the passage above and see a pixie working at center of passage. Check the torch on the wall. Left side room by second area: Go back down to second area. Then go left to the side room. See a hose-water skin on the ground. Wait until the nearest pixie is halfway back to the wall to pick up the empty water skin. Go to first area and use the water skin on water trough to get a full water bomb. Lit passage: Go back to lit passage going up twice. Use the water bomb on the lit torch. Now it's dark. Go to end of passage above. Third area: See a pile of stones. There are 3 pixies working the lit passage. Use dynamite on the rubbish heap-pile of stones. Go back down to the now unlit passage. Take the extinguished torch from the wall. Go down and left to where the water skin was taken. Time your movement when the nearest pixie is close to the wall. Use the unlit torch on the camp fire to get lit torch. Go back to the rubbish heap with the dynamite. Use the lit torch on dynamite. The passage fills with smoke. Take the Helmet: Go to the passage at top right now that the smoke covers Nate. Be on the level above the altar. In inventory combine the unbreakable string with the magnetic stone to get magnet on string (pictured as string only). Catch helmet with magnet by clicking magnet on string at bottom of screen. Watch what happens. The pixie throws the helmet out of the mine. Go down to the altar. Look around and see a pixie cleaning a dragon head. At the passage that had the smoke before, check the veins in the rock wall. It is copper deposits. Keep going down to exit the mine. Pick up the helmet. Talk to the crying bride. She knows where the shield is located but would not let anyone else be happy while she is in misery. In inventory, combine the feather or Indian ink (from teepee) with the blank paper (poster from Orc gate). Write a loving letter from Maximilian to the crying bride. Select dialogues: High-born Miss; the voices; fate kicked in; with considerable headaches and a malign curse. Use the love letter with the dripping wax candle by the crypt entrance. Go to the sarcophagus beside the crying bride and see the signet ring worn by the statue. Use the love letter with wax blob with the signet ring. Give the sealed love letter to the jilted maiden. The maiden is now happy. The bride says that the fat ogres took the shield with them to the cave. Two headed ogre: Use the map and jump to the cave at top left of the map. Look at the gap at middle of the path. Look at the 2 headed ogre. Look at the huge plate of food on the ground in front of the ogre. It's the shield. Talk to ogre. Learn that Blout on the left is hungry and Zloff at right is a battle mage. They are half-brothers from the Lightning Fist tribe. The shield is Blout's favorite plate. Blout can eat after Zloff finishes reading. Prepare a trap: Go left to the gap. Use the rotten boards taken from outside the Orc camp on the gap. Go back to the ogre. Look at the clay flagons at bottom right of the screen. It is XXXX strength. Talk to Blout. Learn that Zloff likes drink cocktail. Drunk very quick. Nate will make them a cocktail. The cocktail should be made of alcohol that blows your head off and an umbrella. Get ingredients for cocktail: Take the hose left of the path by the sword. Take the sack of fermenting apples just inside the cave. Open the cupboard and get umbrella. Prepare cocktail: Jump to crypt and then go right to ogre camp. Use the sack of rotten apples on the press top of the garbage heap. Press the apples to get fermented apple juice. Go back to the left and up to the teepee. Look at the pot on top of the fire. There are holes on the cover. Use the hose on the cover of the pot. Open the pot and place the fermented apple juice inside the pot. It is distilled once. Do it again. Place the container with weak alcohol in the pot. Do it once more. Place the container with strong alcohol in the pot. That ought to do. Get container with ogre strength alcohol. Set the trap: Go back to the 2 headed ogre. In inventory, combine the container with alcohol with the cocktail glass and then with the umbrella. Give the ogre cocktail to Zloff. Zloff realizes that they are trying to get him drunk. Blout hit Zloff's hand to get alcohol in his eyes. Blout empties the shield tray of food but is still hungry. He will go hunting. Talk to Blout and learn that he is hunting for anything. In inventory combine the string with the Paladin's pink pompom. Lure Blout by clicking the pink pompom attached to string on Blout. Take the shield of power. The shield also talks. Marx is the helmet. Vladi is the sword. Esther: Jump back to the crypt. Take Esther's head from top of the pole. Go inside the crypt. Unite Esther's head with her body. Love at first sight. Wow! Gulliver will not only tell Nate where the sword is located but will give him an armor if he fixes Gulliver's body soon. Lungs: In inventory, combine the broken bellows from the teepee with glue from the worktable. Then seal the hole with the piece of leather taken from the inner crypt to get repaired bellows. Give the repaired bellows to Gulliver. Heart: Talk to Gulliver and tell him that you can't find a heart anywhere. Oh my! Esther donates her heart. Electrify the body: Esther and Gulliver went out to erect the antenna. Talk to Gulliver outside. They are waiting for lightning to strike. It is part of the deal. Go to the shaman at the teepee. Talk to the shaman. He is out of ghost mushrooms. Talk to Gulliver about the ghost mushrooms. They are small purple mushroom with green spots. Talk to the Chief Zombie inside the crypt about the mushrooms. There is no ghost mushrooms to be found. Make colors: If you haven't yet, take white mushrooms from the base of the dead tree outside the crypt. If you haven't yet, get red earth from right of the cemetery gate. Go back to teepee. Use the red earth taken from cemetery gate on the mortar to get red powder. Use the blue blossom taken from garbage heap by Orc gate on the mortar to get blue paste. Go to inner part of crypt. Look at pool of tears left by the crying bride. Use red powder on pool of tears to get red paint. In inventory, combine yellow paint from worktable with blue paste to get green paint. Combine red paint with blue paste to get purple paint. Make ghost mushroom: Paint the white mushroom from the dead tree with purple paint. Use green paint on the purple mushroom to get lilac mushroom with green spots. Talk to Gulliver about the mushrooms rotten smell. Yuck and double yuck!. Get imitation ghost mushroom. Shaman: Go back to the shaman and give him the imitation ghost mushroom. Talk to him about lightning. He can summon the rain but lightning is another matter. He gives the dance steps for the lightning dance, the insult to the Gods. They will then throw lightning on Nate. Dance dance revolution: Go to the dead tree in front of the cemetery where the antenna is located. Click on the dance step paper given by the shaman. Using your computer's keyboard's arrows; click the arrow keys similar to that scrolling in the game when the game arrows are inside the brackets. Make as few mistakes as possible. The game is forgiving after several tries. Good luck. Enough! Lightning strikes the tree and Nate. Follow Gulliver and Esther inside the crypt. Talk to Gulliver. Learn that the armour is inside the grave by the dripping candle. The sword is at Fiery Mountain, a volcano with a dragon in residence. Nate takes the armour from the grave. 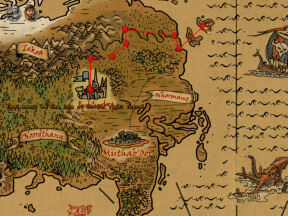 Use the map to go the Fiery Mountain at right of map. Talk to the lady transport dragon that carried MacGuffin and was released by Ivo. She wants to be a feared dragon, a position usually held by male dragons. Nate will give her a starter gold coin for her hoard and she will give the sword. Look at the lava bowl -headless metal dragon. Check the hole where the head was located. Check the furnace. Take the stone bowl right of the furnace. Check the coin press machine left of the furnace. Check the anvil and stone trough. Take the pliers and hammer. Take a glittery stone from the ground at left. Pixies: Remember where we saw a dragon's head. The pixie at the altar was cleaning the sooty dragon's head. Pixies love shiny things. Lay the stone on the anvil. Hammer about the anvil by clicking the hammer on the anvil. The stone splits open to get stone with crystals. Jump to the pixie mine. Go up until the once smoky passage and then right. Go down to the altar. Give the stone with crystals to the pixie cleaning the dragon's head. Take the stone dragon's head. Take also offering - gold nuggets from the altar. Jump back to the Fiery Mt. Use the dragon's head on the hole of the lava bowl. Check the hatch of the lava bowl. Pull the chain of the lava bowl to open the hatch and get lava inside the furnace. In inventory, combine the stone bowl and gold nugget. Place the stone bowl inside the furnace. Use the pliers on furnace to get the stone bowl with melted gold. Use the melted gold on the gold press at left. Look at press to get gold coin. Give the gold coin to the dragon. Broken sword: Nate looks for the sword under the dragon. Nate takes a head of a pickaxe. Nate gets a broken sword. Read the smithying book in inventory. Only level 98 smiths can reforge a sword. Nate has to practice smithying until he can get to level 98. The book says to make copper pots. It only requires copper. Get copper: Jump to the pixie mine. Go to the passage where once was smoky. Check the vein of copper on the wall. Take the wood - handle from the cart in front of the copper vein wall. In inventory combine the handle and the head of a pickaxe to get pickaxe. Use the pick axe on the wall to dig out copper ore.
Make copper pots until level 98: Jump back to the volcano. Place the copper in the stone bowl. Use the stone bowl with copper in furnace. Use the pliers-tongs on furnace to get melted copper. Use the melted copper on stone trough to get copper. Use copper on anvil. See 98 copper bowls Nate made. Reforge the magic sword: Place the broken sword on the anvil. Harden it in dragon fire: Talk to the dragon. Select dialogues that will make the dragon angry. The different items of the kit talk to each other. Check the shaman at the teepee. The shaman is way out of it. Go to the Orc camp. Talk to the Chief Orc. After showing all the parts of the kit; enter through the gate. Playing as Ivo and Critter: Inside the dungeon of Mortroga's castle, see Ivo and Critter hanging from the ceiling. As Ivo: Talk to Tschiep Tschiep. Talk to Critter. He releases himself from the manacles and takes the bar from the torture rack. The bar doesn't work on freeing Ivo's legs. As Critter: Automatically change to Critter. Take the bar again. Check the hanging skeleton and get piece of cloth. Exit through door. Critter slides under the barred door. Troll: See a sleeping troll. Under his foot are keys. Try to take the keys. Try to take the hammer in front of the troll. Too heavy. To the right is a dog kennel with bowls that have fire. Mortroga: Go up the stairs and see the back of Mortroga's throne and the Black Guard. See a vase that Critter can hide in. There's a locked chest, barrel at bottom of screen and cushion by Black Guard. Go left and see cannonballs. Beside Mortroga is a table with parchments. Far left of the parchment and beside the cannonballs is a rusty basin with black liquid. Get the keys: In inventory combine the bar and the cloth from the prisoner. Dip the improvised torch on the greasy black substance. Go back down to the dog kennel. Use the torch dipped in black liquid on the fire to light it. Use the burning torch on the troll's trousers. Immediately Critter hides. See the troll run down the tower. Take the keys. Go back to the dungeon. Use the keys on the leg manacles of Ivo. Ivo releases her arms. As Ivo: Look around the dungeon. Check the 2 torch holders in the cell; the cage, red phone booth. Pulling the torch holder by the window opens the phone booth. Check inside the phone booth and see pictures and writings. Pull the torch holder by the door and nothing happens. Check the bars with the lock. Talk to the something inside. It's snoring. As Critter: Exit the dungeon. Take the rubber chicken hanging by the troll's chair. Go back up to Mortroga's throne area. Take the red cushion beside the Black Guard. Open the barrel and look through the pictures until Critter takes one picture. Go left and push the cannonball. Watch where it rolls to. Go back down and go left to the dungeon's window. Move the stove pipe so that the left end is inside the window. Place the red cushion on the plank protruding from the wall and where the cannonball landed. Go back up to Mortroga's throne area again. Push another cannonball and see it land on the red cushion. Go down and push the cannonball. The cannonball goes inside the dungeon. If not, move the stove pipe until another cannonball try does. The cannonball is in the dungeon. Go back to the dungeon and give the lit torch, rubber chicken and the picture to Ivo. As Ivo: Place the picture on the dungeon door's viewing window. Use the rubber chicken on the torture rack. Pick up the cannonball. Use the cannonball on the rubber chicken stretch on the rack. Ivo is waiting for a target. As Critter: Exit the dungeon. Taunt the troll. Critter immediately goes back to the dungeon. Now you have a target. Ivo fires and the dungeon door is open. They place the troll in the empty cage. As Ivo: Wake up the something in the cell right of the troll. It is MacGuffin. The lock is magically sealed by Mortroga; so only her wand can unlock it. As Critter: Go to Mortroga's throne area and hide inside the vase. As Ivo: Go upstairs and take the hammer from the Troll's nook. Use the burning torch on the banner above the stairs going to the throne area. The Black Guard checks the fire. As Critter: Take a parchment from the table left of the throne. Climb back into the vase. Wait until the Black Guard goes back beside Mortroga. Go back to the dungeon. Give the frost spell to Ivo. As Ivo: Check the frost spell. Use the freeze spell on the bars of MacGuffin. She doesn't know how to cast a spell. Give the freeze spell back to critter. As Critter: Use the freeze spell on the bars. The bars are frozen. As Ivo: Use the hammer on the bars and they shatter. MacGuffin is freed. He shows Ivo his lock pick. Ask MacGuffin to check the phone booth. MacGuffin needs a number and coins. Get coins: Ask MacGuffin about the lock pick. He gives his lock pick to Ivo. Go to the throne area. Use the lock pick on the chest beside the vase and barrel to get coins. Go back to dungeon. Give the coins to MacGuffin. Get number: Pull the torch holder left of the dungeon door. Ivo asks MacGuffin to pull the other torch holder. A secret compartment at the center opens. Take the phone book. Give the phone book to MacGuffin. MacGuffin looks for the number. Wow - 2. Phone booth: They all pile in the phone booth. MacGuffin dials and they are outside the castle. Nate enters an empty Orc camp. There is only the one legged chieftain left. The chief is the referee of the contest. Nate is fighting Ma'Zaz. They can't give Nate to the arch witch because he is a warrior. The contest is of strength, skill and speed. Nate can start the contest anytime. He has to stay inside the camp or else he is disqualified and is fair game. Talk to the Orc chieftain. The contest of strength is to throw the dwarf, a painted tree trunk as far as he can. Ma'Zaz throws the dwarf and the distance is measured by the chief using a measuring tape made of socks. Ma'Zaz' throw was 12 feet. Ma'Zaz graciously gives herself a handicap. Nate can do as many attempts to improve on his performance until the sun sets. Watch Nate throw the dwarf. Okay - cheat. Find help: Look around. Look at the termite mound left of the fort gate. Talk to the termites and ask for help. They can hollow out the dwarf but in return they want a 1784 Château Latife board. Go to the right screen back of the camp. See the biggest tent in the camp. Enter the tent. See a hooded stranger exit the tent. Nate talks to Wilbur hanging upside down on the totem pole. They talked about heroic valour and contest. 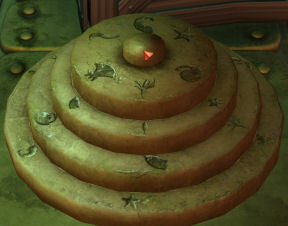 Learn where the artefact is located and see it surrounded by a powerful spell. Check the basket at top of screen. Take the wooden board from the Chateau whatitsname. Exit the tent. Talk to Bill, the merchant sitting at right. Go back to the front part of the camp and talk to the termites. Nate gives the board. Use the board with termites on the dwarf to put the termites on the tree trunk. Click on dwarf to hit it a second time. Nate throws the dwarf. Nate won by 6 toes. That looks shorter though. Go right to the back of the camp. Talk to the Orc chieftain. The contest of skill is archery. See Ma'Zaz hit dead center of the target. Nate needs a bow and arrow. Get an arrow: Enter the chieftain tent and look at the skull of the skeleton by the tent door twice. Nate takes the arrowhead sticking from its head. Go left to the front of the camp. Look at the tree by middle tent and get a branch-shaft. In inventory combine the shaft and arrowhead. Add the feather that was taken from the shaman's tent earlier to get an arrow. Get a bow: Talk to the hooded figure by the gate. The hooded figure told Nate to ask the merchant for 98 copper pots. Talk to the merchant. Then go back and talk to the hooded figure. He leaves to get a bow. Go to back part of the camp and then go back to the hooded figure by the gate. Get a bow. Archery: Talk to the Orc chieftain. Learn about the contest. If Nate wins 2 out of 3 of the tests, Ma'Zaz can choose what she wants for her one win. If they make a draw, they will split the prize. Nate then has to win all the tests. Nate shoots and he is way off. Get Ma'Zaz to lose: Go left and talk to the merchant. He's got the 97 copper pots now. Bill has items that might be of interest: shrinking ring, magical stone... The magical stone attracts metal of all kinds. Nate asks if they can play a game to win the magical stone and bets the warrior set. The merchant wants a number game. Go left and talk to the hooded figure. The figure gives a crumpled note. Read the note in inventory. It has 42, 79 and 2.5 written on it. Talk to the merchant about the numbers game - magic stone. Nate tells the merchant to write down the 3 numbers. Nate wins the magic stone. Go to back of the camp and place the magic stone at back of the archery target. 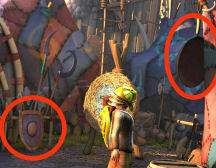 Get Nate to win: Look around the back of the camp and see 4 items hanging on wall that can be moved: shield by chieftain's tent entryway, the wok at top right screen, the turtle shell and pan framing the entryway at left of screen. By trial and error and shooting the target, learn how to adjust those 4 items. Each of those 4 items can be moved 3 times: left middle and right. Move the shield on the ground right of the chieftain's tent entryway to the middle or second position to be at slight angle facing up. Original position is the 3rd position at maximum angle facing up. Move the wok hanging at top right at right screen to face the target and be at rightmost position. Original position is facing the entryway or leftmost. Move the turtle shell left of Ma'Zaz to middle position facing the wok across the area. Original position is facing the entryway. Move the pan right of Ma'Zaz to the leftmost position to face the turtle shell. Original position is middle. Talk to chieftain to shoot. Watch Ma'Zaz miss the bull's-eye this time and the path of the arrow Nate shoots. If Nate doesn't hit the target, make slight adjustments. Go to front part of the camp and learn about the third contest. Ma'Zaz wants the head of the prize. She withdraws her handicap. Nate and Ma'Zaz have to run to peak of mountain and back. Whoever gets back to the camp first wins. An out of breath Nate returns back to the Orc gate and is told that he won the race. Playing as Wilbur: Wilbur is freed but the chieftain would not relinquish the artefact. Nate accepts the drink to his victory and leaves Freed Willie in the tent. Look at the artefact - little box and the magic circle. Look at the basket and get a red thread. Go outside and talk to the chieftain. Watch Nate. Learn about the magic circle. Neutralize the magic circle: The chieftain gives the box that the magic circle came in because only he knows the password. Examine the magic circle package and get instructions and mithril foil. Read the instructions. The evil eye will be neutralized only by the correct password. Check the mithril foil and learn what to do if the password is forgotten. A protection from the evil eye can be made from wire and mithril foil. Make evil eye protection: Look around. Check the target twice and take the magic stone placed there by Nate. Go left to front part of the camp. Look around and see a TV antenna atop the right tent. In inventory combine the red thread with the magic stone. Use the thread with magic stone on the wire-antenna. Combine the wire and the mithril foil to get a helmet - head protection. Get the artefact: Go back inside the tent. Use the head protection. Enter the magic circle and take the little box. Wilbur learns the password. LOL. Try to take the little box. Wilbur can't take it out of the camp since the chieftain will check him. Get the artefact out of the camp: Exit and go to the front part of the camp. Look at the termite mound. Talk to the termites. Wilbur tells them about the box. Wilbur automatically carries the termites. Go back to the tent. Wilbur feels someone is in the tent watching him. The termites carry the box. Wilbur tells Nate that they are ready to leave. The termites want the power of the amulet. Nate takes care of that threat. Wilbur and Nate exit the Orc camp. Munkus and the shadow army are waiting for them. Munkus takes the box. See Munkus present the box to Mortroga at her throne place. Ivo joins Nate and Wilbur. Using an amulet, Nate and Wilbur leave Mortroga's castle. Ivo watches as Munkus asks Mother why he should give her the box. Ivo joins Nate and Wilbur in front of the Orc camp. Ivo explains that she, MacGuffin and Critter escaped the castle and met with the real arch mage. She uses Telarion the amulet that can teleport through space and time. Down! See Nate arrive at the Orc camp wearing the kit. Ivo gives a bag to Wilbur and asks him to replace what is inside the box with it. Ivo tells Nate to help his other self to win the competition and gives him something to put on. See Nate wearing the hooded figure outfit. Enter the Orc camp. The Orc chieftain mistakes Nate as Kallup, the arch witch's spy. Look at the display board. Take the sock measuring tape hanging on the sign. Overhear the chieftain and Ma'Zaz talk about what the bounty hunter will do with Nate. Get the board for the termites: Go right to back of the camp. See the other Nate and the merchant. Enter the tent. Look and click on the cushion at top of the screen. Nate says that is where the board wanted by the termites was supposed to go. Jump to the crypt. Check the locked gate. Talk to the undead ghost jester. Ask for a board from 1784 Chateau Latife. The jester says to check the coffins at the graveyard. Click on all 3 crosses of the active graves to check the date of expiration <sic>. Go back and talk to the jester again. He shows the familiar board for Nate to take. The request by the termites could be any old board. Go to the Orc camp and the chieftain's tent. Place the bog standard board onto the cushion in the chieftains' tent. Leave the tent and meet the other Nate. Sabotage the measuring tape: Go to the shaman's teepee. Look at the shaman. Check the open pot. The water begins to simmer. Boil the socks. Nate takes the boiled socks and see that the socks shrunk. Get shrunk sock measuring tape. Go back to the Orc camp. Hang the sock tape measure on the sign. Exit and then come back in to watch how the other Nate wins the contest. Now we need an antler bone bow. Get antlers: Go to the shaman at the teepee. Talk to shaman. He wants firewater for his deer antlers. The other Nate asks for bow. This Nate tells him to ask the merchant for copper pots. The other Nate asks for something to stop Ma'Zaz from winning. This Nate gives him the crumpled note. Go back in and talk to the merchant about firewater. He will trade for 97 copper pots. Jump to the volcano. Talk to the dragon. Take 97 copper pots and one nice copper pot for the Mary. Go back to the merchant at the Orc camp. Talk to the merchant and get precious firewater. Go back to the shaman and get the antlers. Learn that firewater is common and costs only few copper. Complete the bow: Jump to the 2 headed ogres. Go right and check the cupboard. Get the Zloff's dental floss. In inventory combine the string and the antlers to get a bow. Go back to the Orc camp. Nate gives the bow to the other Nate. Go right and see other Nate win the archery contest. Find someone to stop Ma'Zaz: Go outside to the front of the Orc gate. Look at the trash heap of rubbish and get a gnomish hot air balloon. Jump to the 2 headed ogre cave. Look in the rock crevice and the ogres ask who's there. Answer Ma'Zaz. Nate gets the ogres angry at Ma'Zaz. Talk to the ogres again as Nate. Nate describes Ma'Zaz to the ogres. Get the ogres out of the crevice: Go right and check the camp fire. Use the gnome hot air balloon on camp fire. Nate tries to raise the ogres using the hot air balloon. It won't work. Blout is too heavy. Go back to Orc camp and talk to the merchant. The merchant gives the shrinking ring. Go back to the ogres. Throw the shrinking ring down to the ogres. Grab her boys! Go back to the Orc camp and see what happens. See Wilbur play cat burglar and drop down into the chieftain's tent. Use Ivo's cloth on the little box to swap the artefact. Watch how this Wilbur does the mirror trick. The other Wilbur and Nate are captured by Munkus. These Nate and Wilbur are taken up by Ivo. Ivo has to do something else. Exit the dungeon and climb up to Mortroga's throne room. Ivo picks up the Amulet of Balthazar. Watch what happens when the heroes are atop the former transport dragon and the pixies arrive to save Wuuzaaa. Watch the gorgeous artworks during the credits. See the transformed bunny. Maybe there's another adventure waiting for us!